American Idol sweetheart Carrie Underwood took some flak initially from country purists. Her debut Some Hearts, they said, was saddled with too many pop-clichés to really be a good country record. Underwood settles into a more twangy mode for most of Carnival Ride, her second album. I’m not sure if this was a deliberate response to her naysayers, but whatever – it works. Her lyrics are sharper, the music better; Underwood has even penned some of her own tunes, as she has four co-songwriting credits. This isn’t Merle Haggard/rickety porch/backwoods country music, mind you; there are still plenty of pop moments. But the stronger emphasis on country instrumental and “traditional” songwriting really, really suits her well. This is best exemplified on “I Know You Won’t,” a great fusion of pop ballad and country torch burner. Man, the gal has a voice. 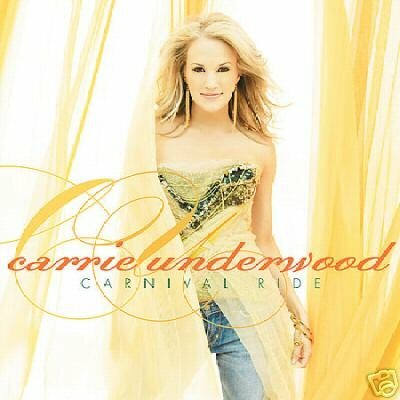 Underwood still hasn’t been around long enough to build up a rapport to challenge any legends in her genre, but Carnival Ride is a good start. If she keeps this up, she’ll be one of those legends soon enough. This entry was posted on November 28, 2007 at 12:17 pm and is filed under carrie underwood, jp, music. You can follow any responses to this entry through the RSS 2.0 feed. You can leave a response, or trackback from your own site.